Amazing with an invisible talisman on the magical stamps on the magical date. 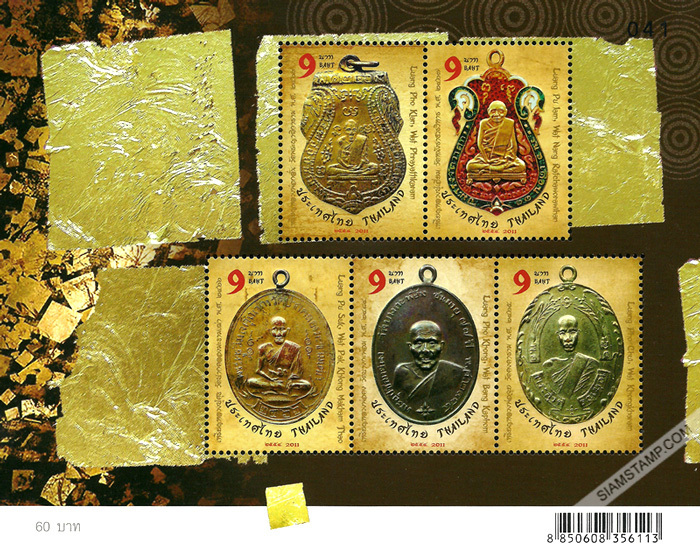 Thailand Post recognizes the occasion of an auspicious date (11-11-11), and has planned to be issuing a set of Five Venerated Monks Medallions postage stamps. Due to November 11, 2011 in the World is occur only once in 100 years by the same number of day, month and year. It is also a significant number of excellence in a symbolic gesture. Thailand Post will be issue a special stamp that mean a fortune in the series “Set of Five Venerated Monks Medallions Postage Stamps,” 5 designs and 9 Baht price each, in that day. The design and colors look admirable. With various special printing techniques including, Embossing, Four-color printing on foil to feel like the real medallions and the talisman pattern which is printed on the back of the medallions are printed with Invisible Ink that can be seen by ultra-violet light. These make the stamp set is supposed to build a great sacrifice and keep to your collections as well. Believe that is the one of the sacred object postage stamps will get highly attention as well as two sets of five amulet stamps in several years ago.